Birthplace : Fayetteville, Arkansas, U.S. 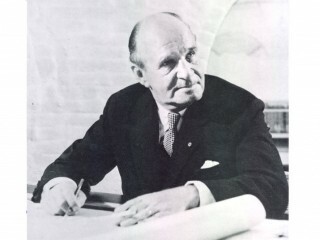 The American architect, educator, and designer Edward Durrell Stone was an early practitioner of the International Style, but took his architecture in a new direction after 1940. He was particularly known for his design for the U.S. embassy in New Delhi, India, and for the Kennedy Center in Washington, D.C.
Edward Durrell Stone was born in Fayetteville, Arkansas, on March 9, 1902. He attended the University of Arkansas (1920-1923) located in his home town, but received no degree. His first job—for the firm of Coolidge, Shepley, Bulfinch and Abbott in Boston—was to work on the restoration of Massachusetts Hall at Harvard as an apprentice to Henry R. Shepley (1923-1925). In 1926 Stone won the competition for a special scholarship to Harvard and attended for one year. Eclecticism was on the way out in architecture, and Stone switched to MIT (Massachusetts Institute of Technology) where Jacques Carlu was beginning to experiment with modern design. The following year Stone won the Rotch travelling scholarship for two years of study and travel in Europe. His return to America in November 1929 coincided with the stock market crash. He managed to join the firm of Schultze and Weaver in New York and worked on the design for the interior of the Waldorf-Astoria Hotel. In 1930 he married Orlean Vandiver, whom he had met in Europe. Stone also worked with the consortium of architects designing Rockefeller Center, New York (1929-1935). He was appointed chief designer of the two theaters: Radio City Music Hall and The Center Theater. During this period Stone met Howard Myers, the editor of The Architectural Forum and a leading exponent of modern architecture. Their friendship was life-long. In 1933 Stone became an architect in his own right with the commission for the Mandel House in Mount Kisco, New York (1933-1935). He made use of an open plan, concrete, steel, glass block, and strip windows in this modern house and saw it as the first house in the East in the International Style. He built several other private residences, but the Depression made commissions scarce and he went to work for Wallace K. Harrison. During this time the informal headquarters for architects and journalists in New York City was Rose's Restaurant on West 51st Street. Rose was considered a patroness of the arts as she provided meals to sustain artists and others between odd jobs. From 1935 to the beginning of World War II Stone supplemented his income by teaching advanced design at New York University's night school of architecture. His students were men working in architectural offices who could not afford full-time studies. He again turned to teaching in the late 1940s for three years at Yale, in 1953 for one year at Princeton, and in 1955 and 1957-1959 at the University of Arkansas, Fayetteville. In 1937 the trustees of the Museum of Modern Art (MOMA) formed a building committee to select architects to design a new building on West 53rd Street in New York City. Stone and Philip L. Goodwin, one of the trustees, were named associate architects for the design (1937-1939). Open flexible gallery space capable of change for exhibitions was required, and as a result Stone and Goodwin placed the auditorium in the basement, the stairs and service facilities at one end of the building, and office spaces and the library on the upper floors. A walled garden for sculpture was set to the rear of the building as an oasis from the hectic pace of the city. The design for this important building was done in the International Style. Toward the end of the 1930s Stone began to question the use of the International Style in residential design. Generally, it had not won acceptance because it was sparse and cold. The style had begun shortly after World War I in a period of deprivation. Economics was the prime consideration, and the use of reinforced concrete—a less expensive material—and the exclusion of ornament from the design reduced the expense of a building. Even more influential on Stone's change of mind was the cross-country trip to California he took in 1940. During this trip he saw the "good" and "bad" architecture of the United States and visited Frank Lloyd Wright at Taliesin in Wisconsin. On the return trip he visited Taliesin West near Phoenix, Arizona, where he became more aware of how Wright attuned each complex to the natural beauty of its site: the pastoral green of Wisconsin and the harsh desert environment of Arizona. Stone viewed his repudiation of the International Style as trading a European style architecture for an indigenous style which would be strongly influenced by Wright's work. Collier's magazine provided an opportunity for Stone to design in this new direction. Stone and John Fistere, a journalist who wrote on architecture, were asked to design Collier's "House of Ideas" (1940), which would make new ideas in home furnishings and building materials available to the public. Located on the terrace adjacent to Rockefeller Center's International Building, Stone introduced the use of natural redwood for the exterior walls and plywood as an interior surface material. During World War II Stone served as a major in the U.S. Air Force (1942-1945) and worked as an architect designing buildings and ground facilities (hangars and runways). After World War II he established an office in Great Neck, Long Island, and designed houses. One of these residences was for Bernard Tomson, a lawyer who took an interest in the legal aspects of the architectural profession and eventually wrote a column and a book for architects to help them with their business affairs. Stone moved his offices to New York City and was joined by his nephew, Karl J. Holzinger, Jr., who worked with him for seven years. Commissions were primarily for residential designs which were done in an indigenous style based on modular wooden construction. After World War II Stone was asked to design a modern resort hotel in Panama which called for special consideration of the extremes of the equatorial climate. The design problems worked out for El Panama Hotel, Panama City (1946), were further refined when Stone designed resort hotels in San Salvador (1952) and Montego Bay, Jamaica (1952). In 1948 Stone was asked to design a fine arts group for the University of Arkansas, Fayetteville, to include facilities for architecture, painting, sculpture, music, and theater. Stone physically integrated the arts in three separate elements (a three-story classroom building, a concert hall, and a theater and library) linked by an exhibition gallery. The Peruvian government selected Stone and Alfred Aydelott to design a general and maternity hospital for 900 patients in Lima (1950). Stone believed there was no more difficult or complicated architectural project than a hospital. This one took several years to complete, and it was necessary for the designers to live there for about six months in the early stages. While there, Stone travelled to Cuzco and Machu Picchu and started a collection of Pre-Incan pottery. Stone credited his second marriage with bringing order to his life. On a night flight from New York City to Paris in 1953 he met Maria Elena Torchio, the American-born daughter of a Florentine architect and a Barcelona mother, and they were married in June 1954 in Beirut, Lebanon, by the archbishop of the Greek Orthodox Church. In order to take architecture out of politics, the U.S. State Department appointed a board comprised of Henry R. Shepley, Ralph Walker, and Pietro Beluschi to advise them in selecting an architect to design the U.S. embassy at New Delhi, India. Stone was awarded the commission in 1954 and found he had to deal with a subtropical climate. Some of the devices he used to compensate for the extreme heat were a water garden for its cooling effect, terrazzo grilles for the external walls for their light filtering qualities, and a large rectangular canopy extending beyond the walls of the building for its shading ability. Stone placed his classical building on a platform so that automobiles could be parked in the space below, thus preventing their visual intrusion on the building. An Indian religious leader, Mohan Singh, and his son, Daljit, were chosen as builders. They brought the workers and their families to live at the site where they fabricated the building materials. The U.S. embassy was literally built by hand with a combination of Eastern and Western skills. In 1955 Stone was asked to design a hospital and medical center for the city of Palo Alto, California, and Stanford University. He found it necessary to open an office in Palo Alto. The design he arrived at was to be compatible with the original quadrangle of three-story buildings designed by Shepley, Rutan, and Coolidge. Because this was earthquake country, reinforced concrete was the preferred building material. To imitate the rough stone of the earlier buildings, Stone created a geometric pattern in the concrete by nailing wooden blocks onto the casting forms. In the same year Stone designed a pharmaceutical plant for the Stuart Company in Pasadena. The company's founder, Arthur Hanisch, gave Stone a large site and a free hand to design the plant and amenities (recreation areas, courtyards, and a swimming pool) for the employees. The morale of the workers and the prestige of the company were influenced by the architecture, a trend recognized by corporations in the 1950s. An American Institute of Architects (AIA) committee of five architects selected Stone to design the U.S. Pavilion (1957-1959) for the Brussels Exposition. The irregular site seemed best served by a circular building, and Stone adapted the principle of the bicycle wheel (inner and outer rings connected by radiating spokes) combined with translucent plastic panels to cover the 350 foot diameter interior open space of his design. This space allowed the United States to honor the Belgians' request to preserve the 11 willow trees planted 50 years earlier by King Albert. The white, crystal, and gold pavilion with its plaza and reflecting pool drew a cover story by TIME and an invitation from the Russians for Stone to visit their country. Stone had long held the conviction that row housing made better use of land than the free-standing house on an individual lot. The open countryside around towns and cities should be preserved. LIFE was doing a series of essays on more livable homes and in 1958 asked Stone for a design. He suggested a row house development, noting that there was much historical precedent for it and that the "urban sprawl" of the American subdivision might be abandoned for it. This same year Huntington Hartford chose Stone to design his gallery of modern art to be located at Columbus Circle in New York City. Due to the small site, Stone arranged the galleries vertically and selected poured concrete for its plastic possibilities. The entire building was surrounded by an arcade which provided protective covering for prospective museum goers. The romantic design Stone used here was in sharp contrast to the severe International Style he had used 20 years earlier for the MOMA. In the fall of 1958 Stone began work on a plan for the National Cultural Center (Kennedy Center) in Washington, D.C. (1958-1971). He developed two schemes for the 11-acre site on the Potomac River which included an opera house, a concert hall, and a theater under one roof with parking facilities at a lower level. The first scheme placed the three auditoria around a grand central circular hall, while the second scheme arranged them in a row and separated them by entrance lobbies. Cost was the deciding factor in the selection of the second scheme. Hopes for a truly national cultural center of stature would have been better served by the first scheme. The critics used terms such as bland and uninspiring to describe the Kennedy Center. As Stone designed more complex and larger scale projects, such as the State University of New York at Albany campus (1962), he turned to an academic style of architecture that sought formal simplicity. Though work such as this received less than complimentary acclaim, Stone retained his popular appeal. One of his last works, the PepsiCo World Headquarters, Purchase, New York (1971-1973), was representative of the low suburban office building. In a move from Park Avenue to an old polo field, PepsiCo acquired a 112-acre site where building height was restricted to 40 feet by a local zoning code. Stone designed a series of seven three-storied buildings to be set on a mounded site of ten acres. He created an interplay between the buildings and open spaces, with each building connected to its neighbor only at the corner. Patterned precast concrete panels were used to enrich the exterior surfaces of these low horizontal structures, while sculpture was placed in the surrounding landscape. View the full website biography of Edward Durrell Stone.